This year, we are developing A Detector I which utilizes three orthogonal connection systems to detect enzyme-catalyzed reaction products qualitatively and quantitatively. To make the enzyme complex and our detection device (which is an interdigital electrode) connected, we choose the curli system of E. coli to create a functional nanofiber network to serve as a mediator. According to the article published in 2015,  the process of the biofilm functionalization with enzymes through the covalent modification of curli fibers is showed in Figure 1. First, E. coli expresses CsgA fused to the 13 amino acid SpyTag (CsgA-ST), which self-assembles into curli fibers on the surface of the bacterium. Then it is covalently modified with an enzyme fused to SpyCatcher. Finally, substrate to product catalysis occurs on the high surface-area catalytic fibers. In our approach, we transformed PHL628-△csgA cells with pBbE1a plasmids with CsgA-SpyTag to express curli as the base. Curli from different strains will connect adjacent bacteria to form biofilm. Since there’re three orthogonal systems — SpyTag/SpyCatcher, SnoopTag/SnoopCatcher and SdyTag/SdyCatcher , we synthesized a string of three enzymes rather than one single Enzyme. The method is illustrated in Enzyme Scaffold. As it was mentioned in the beginning, the curli fiber system serves as a mediator between enzymes and the electrodes. We have to pay attention to its efficiency. So, another thing we do is to insert histidine-tags into CsgA (the major subunit of the curli fiber) so that curli fibers can be specifically associated to NiNTA-AuNPs, and then to the electrodes. With the help of NiNTA-AuNPs, electrons released by enzyme-catalyzed chemical reactions are able to be delivered to the electrode much more quickly. We contacted Professor Botyanszki and obtained CsgA deficient strains and CsgA enhanced strains from ShanghaiTech University. We used nucleic acid gel electrophoresis to verify the reliability of the strain (Fig.2). 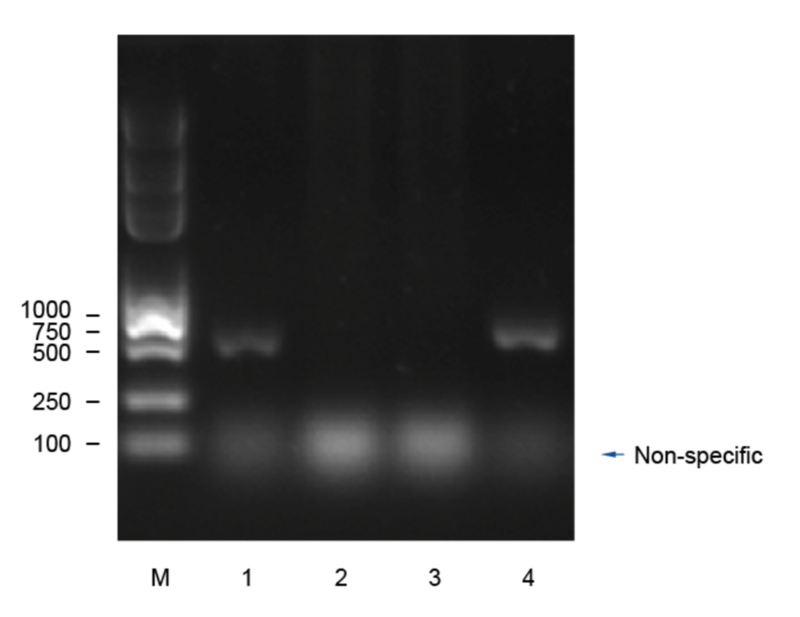 Results of agarose gel electrophoresis.CsgA is about 530bp.Bands are visible between 500bp and 750bp.The deficiency of band of knock-out strain is as expected. Lane 1: WT csgA; Lane 2-3: csgA knock out (PHL628-△csgA); Lane4: recombinant of csgA. Then we transformed the modified Pet-26 into strains to express CsgA with SpyTag and Histag. Eventually, we have successfully expressed modified CsgA! 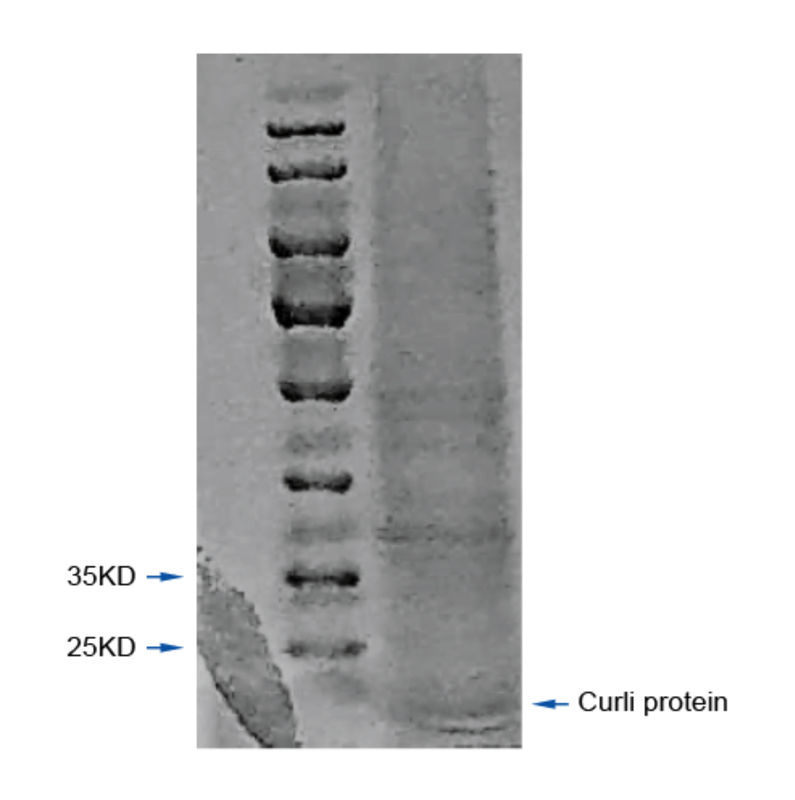 SDS-PAGE electrophoresis results of Curli protein. Curli protein is approximately 17kd. Bands are visible between 15kd and 25kd referring to the marker. To further correlate curli production to activity, we used Quantitative Congo Red (CR) Binding Assays. 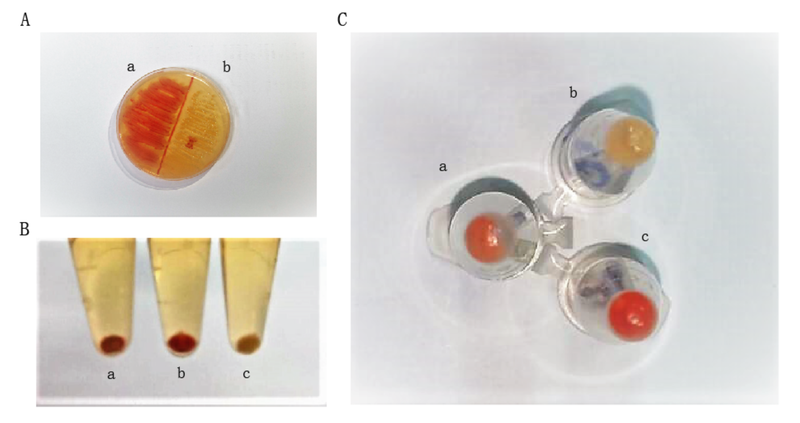 The results showed that the strains overexpressing CsgA could absorb more Congo red and deposit on the bottom of EP tubes, thus reducing the absorbance of supernatant significantly (Fig.4). Quantitative Congo Red (CR) Binding Assays to verify the successful expression of Curli. (A) a is a wild-type E.coli strain that normally expresses csgA protein. b is the PHL628-△csgA cells (csgA knock out) strain. It can be seen that there is almost no expression of csgA after knocking out. (B) a is the wild type strain, b is the csgA overexpressing strain (a plasmid carrying a csga protein is expressed in wild type E.coli), and c is the csga KO cell. By adding Congo red dye to the bacteria mixture, centrifugation and shaking, we can compare the expression level of curli by observing the color depth of the precipitate. (C) Figure C is an inverted view of the EP tube in Figure B, showing the color of the sediment at the bottom of the centrifuge tube. a – WT. b – csgA KO, c – csgA overexpressing. Botyanszki Z, Tay P K R, Nguyen P Q, et al. Engineered catalytic biofilms: Site‐specific enzyme immobilization onto E. coli curli nanofibers[J]. Biotechnology & Bioengineering, 2015, 112(10):2016.e domain that can covalently. Chen A Y, Deng Z, Billings A N, et al. Synthesis and patterning of tunable multiscale materials with engineered cells[J]. Nature Materials, 2014, 13(5):515. Seker U O S, Chen A Y, Citorik R J, et al. Synthetic Biogenesis of Bacterial Amyloid Nanomaterials with Tunable Inorganic-Organic Interfaces and Electrical Conductivity[J]. Acs Synthetic Biology, 2017, 6(2):266-275.